NEW Hobbs Tuscany Supreme 100% Unbleached Cotton Batting, our thickest and most cuddly cotton batting yet, is especially designed to give a soft hand and even appearance. Exceptionally easy to quilt by machine, it is the most plush cotton batting we’ve ever produced. Made with only the finest cotton fibers, this clean, unbleached, long-staple, virgin cotton batting proudly displays the Cotton Incorporated Seal. Containing no scrim or binders, this 100% cotton product is lightly needle punched to resist bunching and shifting. Hobbs Tuscany Supreme 100% Unbleached Cotton Batting should be paired with medium or dark fabrics – if paired with white or light-colored fabrics, natural (unbleached) cotton can slightly darken the fabrics. We recommend quilters test this batting with their chosen fabric(s) to see if ‘darkening’ will be an issue – and if it will be, we recommend using Hobbs Tuscany Bleached 100% Cotton Batting as an alternative. 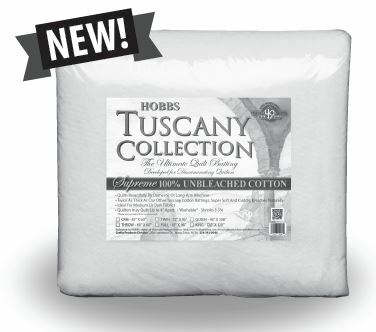 Hobbs Tuscany Supreme 100% Unbleached Cotton Batting may be stitched up to 3-4″ apart, and it is machine washable (once inside a quilt), with shrinkage of 5-7% expected. Please keep in mind that this batting is only lightly needle-punched to allow it to remain soft and fluffy – this can result in more shrinkage unless the quilter heavily stitches/quilts it. We recommend quilters spend time learning about Hobbs Tuscany Supreme 100% Unbleached Cotton Batting before using it on a project – making samples using this batting to see how it needles, both by hand and by machine, and how it launders, provides an opportunity to see if this batting can deliver the desired results.